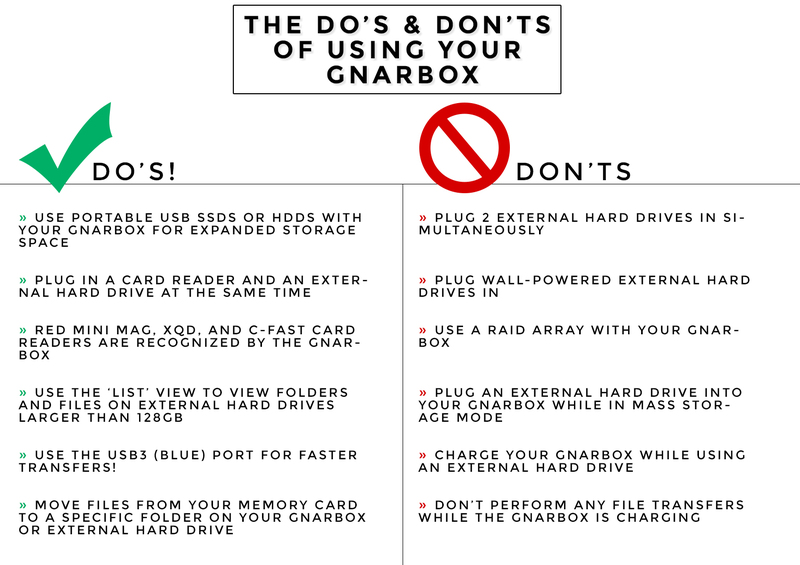 #1 - Don't charge your GNARBOX while transferring or exporting files. This includes exporting photo/video, transferring files from a card, exporting to your phone/tablet, etc. Because of the way power is distributed through the GNARBOX, it is unable to process exports/transfers while charging. Doing so can cause the device to brownout. #2 - When you first insert your memory card, be sure to let it sit for a few minutes to allow video previews to generate. This will help reduce any frustration in waiting for files to transcode. If there are a lot of video files on your card, you may need to let it sit for 10mins before attempting to preview the files. #4 - Keep your GNARBOX out of direct sunlight. The GNARBOX is designed to shut down if it gets too hot, so try to keep it in the shade or indirect sunlight when in use. #5 - The GNARBOX is not a hand held device. Sit the GNARBOX on a table or in a bag while operating. It tends to get hot while in use (like a laptop), so keeping it out of your hands and on a surface will provide for a better experience. #6 - When using multiple devices (hard drive, card reader, phone), make sure they don't pull more than a total of 1AMP of power. Pulling more than 1AMP of power will cause the drive to malfunction. For more information on hard drives, check out our list of recommendations here. #7 - Keep your GNARBOX app and firmware up to date. Our development team is constantly updating and upgrading the GNARBOX, so be sure you are actively receiving those updates via the app store. #8 - If you are experiencing any issues, first try restarting your GNARBOX and quitting the app. You can always reach out to our customer support team at support@gnarbox.com for further assistance! #9 - The maximum file size for a video export is 4GB. Files larger than 4GB will fail to export. If you are having difficulty lowering your file size, try changing the bitrate for export. A full tutorial on how to configure your export bitrate is available here. #10 - The GNARBOX color editing workflow may vary slightly from what you are used to. We recommended either coloring all of your individual video files before dropping them in the Highlight Reel, or exporting your entire Highlight Reel for a finalized color pass. For more information on how to get the most out of your GNARBOX, check out this article!